interplay with the rules of other major arbitration institutions and the New York Convention. The core of each article commentary is an in-depth analysis that provides recommendations to practitioners and judges. The analysis goes beyond the contents of the commented article and deals with related issues that are not addressed expressly in the Law but may be of relevance for the issues covered in the provision in question. Arbitration professionals will find here convincing evidence of the liberal system for arbitration now prevailing in Belgium, along with rules that reflect the most recent trends in international practice. The description and analysis offered are sure to contribute to the recognition of Belgium as a global arbitral jurisdiction. Chapter I General Provisions: Articles 1676 to 1680. Article 1676 Niuscha BASSIRI & Maud PIERS. Article 1677 Erica STEIN. Article 1678 Erica STEIN. Article 1679 Erica STEIN. Article 1680 Maarten DRAYE. Chapter II Arbitration Agreement. Articles 1681 to 1683. Article 1681 Maud PIERS. Article 1682 Maarten DRAYE & Erica STEIN. Article 1683 Niuscha BASSIRI. Chapter III Composition of Arbitral Tribunal: Articles 1684 to 1689. Article 1684 Maarten DRAYE. Article 1685 Maarten DRAYE. Article 1686 Maarten DRAYE. Article 1687 Maarten DRAYE. Article 1688 Maarten DRAYE. Article 1689 Maarten DRAYE. Chapter IV Jurisdiction of Arbitral Tribunal: Articles 1690 to 1698. Article 1690 Niuscha BASSIRI. Article 1691 Niuscha BASSIRI. Article 1692 Niuscha BASSIRI. Article 1693 Niuscha BASSIRI. Article 1694 Niuscha BASSIRI. Article 1695 Niuscha BASSIRI.. Article 1696 Niuscha BASSIRI. Article 1697 Niuscha BASSIRI. Article 1698 Niuscha BASSIRI & Maarten DRAYE. Chapter V Conduct of Arbitral Proceedings: Articles 1699 to 1709. Article 1699 Caroline VERBRUGGEN. Article 1700 Maarten DRAYE. Article 1701 Erica STEIN. Article 1702 Erica STEIN. Article 1703 Erica STEIN. Article 1704 Erica STEIN. Article 1705 Erica STEIN . Article 1706 Niuscha BASSIRI. Article 1707 Erica STEIN. Article 1708 Maarten DRAYE. Article 1709 Erica STEIN. Chapter VI Arbitral Award and Termination of Proceedings: Articles 1710 to 1715. Article 1710 Maud PIERS. Article 1711 Maud PIERS. Article 1712 Maud PIERS. Article 1713 Maud PIERS. Article 1714 Maud PIERS. Article 1715 Maud PIERS. Chapter VII Recourse against Arbitral Award: Articles 1716 to 1718. Article 1716 Caroline VERBRUGGEN. Article 1717 Caroline VERBRUGGEN .Article 1718 Caroline VERBRUGGEN. Chapter VIII Recognition and Enforcement of Arbitral Awards: Articles 1719 to 1721. Article 1719 Caroline VERBRUGGEN. Article 1720 Caroline VERBRUGGEN. Article 1721 Caroline VERBRUGGEN. Chapter IX Time Bar: Article 1722. Article 1722 Maarten DRAYE. Chapter X Entry into Force and Applicability ratione temporis of the B.L.A. : Articles 59 and 60 of the Law Amending Part VI of the Judicial Code on Arbitration of 24 June 2013. Articles 59 and 60 (Law of 24 June 2013) Maarten DRAYE. 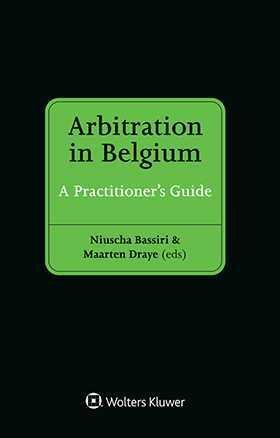 Appendix I Belgian Law on Arbitration (English Version). Appendix II Belgian Law on Arbitration (German Version). Appendix III CEPANI Rules 2013. Appendix IV Comparative List of B.J.C. Terms.